Soft-story seismic retrofitting done right. Unlike much of our competition, soft story retrofits are all we do. 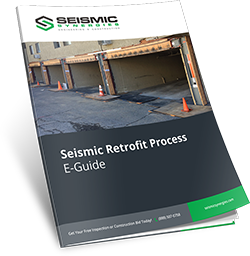 We’ll guide you through the seismic retrofit process from A to Z. Value engineering and turnkey construction services means peace of mind for our seismic retrofit clients. We engineer your soft story seismic retrofit with cost in mind. You’ll never pay for something that you don’t need. Guaranteed! We use the highest quality moment-resisting frames and grade beams to ensure your building is safe during a seismic event. Our 100% financed seismic retrofit solution includes zero up-front cost and 0% percent interest. We offer an A-Z design/build solution, including engineering, construction, and cost recovery. We engineer your retrofit with cost in mind. You’ll never pay for something that you don’t need. Put your trust in a company that specializes in exactly what you need: soft-story seismic retrofitting. Our 100% financed solution includes zero up-front cost and 0% percent interest. We take care of the entire process from start to finish, allowing you to focus on your business. Got a question? We have an answer…quickly. Count on us to keep you in the loop.